Be a Hellraiser for DSC! Cycle the Italian coast in 2018! There are still a few places left on our upcoming seminar with Dr Sarah-Jane Flynn, this seminar will cover the different questions that you, as your child’s main advocate should know when considering the best place to continue their academic and social education. We’re looking for a volunteer receptionist to help out in our newly opened centre. The Future’s Rosie is an inspirational blog written by the father of Harry, Joe and Rosie about this family’s adventures into life including Down syndrome. 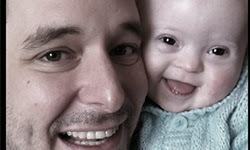 Tom’s ‘Daddy Blog’ is certainly one not to be missed as he shares Rosie’s progress in life.